Where is the Winter Orange? Another interesting question and a fun – and I hope instructive – one to contemplate. Thank you! When you compare the TCI 12-tone Classic and Corporate colour palettes to the suggestions found in other systems you may see things that look closely related or similar – that is, there may be a significant block of colours present which harmonize, or approach harmony, with the hue, value and chroma disciplines of a given TCI palette – while otherwise there may be some very striking differences. Sometimes these differences are easy to understand/appreciate –for example, we don’t have obviously warm (advancing) and cool (receding) colours in the same tonal group, or highly saturated colour in the “Soft” tones – while other choices are not so obviously intuitive. 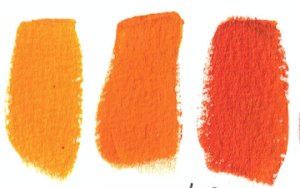 A recent post regarding the True Winter red was written in response to another excellent reader query along these lines (see ‘When is Red not Red’), so let’s revisit, as always, some basic colour theory and explore the possibility of this elusive unicorn, a “Winter orange”. There are two central concepts we need to consider here. The first is the question of what we mean by “harmony” itself. It has been suggested that PCA is a qualitative procedure and that the final result depends on what an individual analysts finds most ‘attractive’; in other words that the results are subjective and while one analyst may decide on one result, another may choose another tone for different reasons. I can’t speak for other systems beyond saying that, like many topics of human interest with no one internationally agreed standard, this is probably one of these things that various schools of thought can and will debate until the end of time. It is fair to say that many things can affect what we think we are seeing: viewing conditions and experience, a learning curve (which is often more of an “unlearning curve”, as the analyst and the client relax into seeing and accepting what is naturally there rather than being swayed by artificial or commercially-conditioned expectations of colour and/or ‘beauty’) and conflicting colour effects external to the analysis (hair dye is a particularly big confounder here), and so on – but what I do know is that when we talk about colour harmony in relation to accurate interpretation of SciART-method 12-Tone colour theory, we are referencing a concept that has a very specific definition and meaning; one which controls for distracting effects and which strives for a result that is demonstrable, objective and agreed as opposed to a subjective ‘preference’. The term ‘harmony’ as defined by the creator of the 12 Tone Sci/ART system, the late Kathryn Kalisz, is this: “‘harmony = related”, a connection between all parts (hair/skin/eyes) and the colours we surround ourselves with which result in a particularly pleasant ‘experience’ for the viewer. In other words: the closer or more related each hue is in any given arrangement (in terms of the three dimensions of colour: hue, value and chroma), the more satisfying the experience is. We perceive harmony when there are more positive than negative ‘effects’ in our field of view. 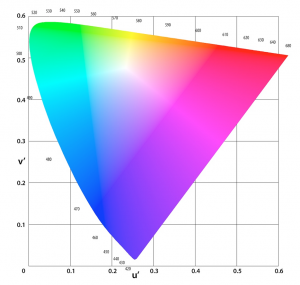 12-Tone theory as taught by TCI emphasizes the need to elicit and relate these effects to a defined area of colour space, and it is this definition of the parameters that gives the system its precision. Below is an example of some of the optical illusions we may experience when looking at skin tones on different backgrounds. 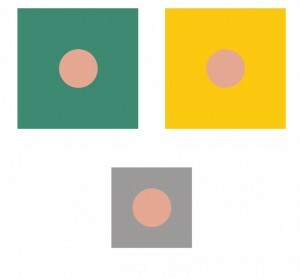 This image is similar to the one from Kathryn Kalisz’s book ‘Understanding Your Color’. When looking at the image ask yourself some questions: what are the differences between the cool skin tone as it appears on the cooler green and the warmer yellow background? Where is the round shape fuzzy/clear, darker/lighter? Where does the true colour of the skin tone (seen when viewed on the grey background) alter least – when it appears on the yellow or on the green? Which feels more relaxing to look at–the yellow or the green? Don’t over-think it – just look. In other words, the superimposition of warm and cool colours gives rise to visual effects which are easily demonstrated. There is no mechanical test for harmony, rather it is detected by the human eye, but everyone has the potential to perceive and understand colour effects in the same phenomenally precise way that they can detect, at a glance, a picture hung a fraction crooked or the most subtle asymmetry. Now let’s return to the idea of a winter ‘orange’ with the second concept we need to consider: the way that colour moves and behaves in nature. 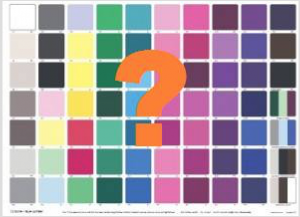 I have said this before and I think that the TCI analysts who attended the recent 12 Tone colour mixing course will agree: to really begin to understand colour you need to mix it yourself. Keeping in mind the limits of our respective monitors, here’s something I prepared a little earlier, an example of a ‘cool’ yellow and a ‘cool’ red. Both are considered ‘cool’ because they each contain blue, and because of their high chroma (as opposed to the low chroma ‘reds’ and ‘yellows’ of True Summer) both the yellow and the red are found in the in the TCI 12-Tone TW palette. Let’s now mix the cool yellow and cool red (as seen above) in gradated proportions so we can see how the resulting colours change and, at some point near the middle, result in a hue which most people would refer to as ‘orange’. And now here comes our key point: would we consider the resulting hues to be ‘cool’ because they are the result of mixing two colours found within a cool tone? It sounds so intuitively “right”, doesn’t it? 1/ How do you determine which is the cool orange? Is it the one with “more” cool yellow or “more” cool red in the mix or the ‘orange’ right in the middle? Which is the ‘cool’ orange? 2) Having selected our example, how does this stack up against the central test in PCA, the optical effects of colour on human skin? 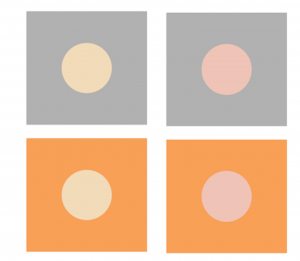 For argument’s sake, let’s choose the middle orange and test the theory using some of the knowledge and skills we have in relation to spotting colour harmony. It’s uncomfortable looking at the example on the right isn’t it? The cool ‘skin’ tone appears greyer and the surrounding orange seems to shimmer, pixellate, vibrate. On the other hand the warm ‘skin’ tone on the left remains clear, calm and creamy. On the right you are looking at visually demonstrated disharmony. It is unsettling, like trying to reconcile 2 + 2 with the idea of 5. For fun and interest, let’s try the same experiment with the other two ‘oranges’ and include a neutral ‘skin’ tone. 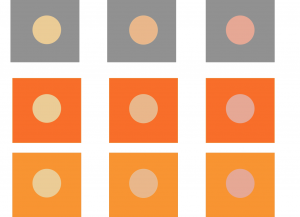 Again we can see that the least altered ‘skin’ tone is the warm on the left, closely followed by the neutral in the middle, with the cool ‘skin’ tone on the right showing the most disharmony when viewed on each of the ‘orange’ back grounds. 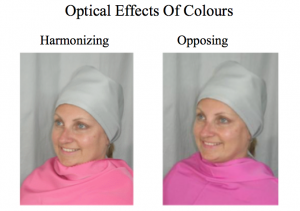 First, the human eye assigns colour harmony by observing some fairly straightforward effects, as demonstrated above. Warm colours seem to advance, cool to recede, and when the two are juxtaposed in disharmony the eye experiences this as a sense of unease, flickering, or dissonance. When we test colours in PCA, we are considering them against the warmth, coolness or neutrality of the skin of the person in question and looking for these effects, though we may describe them in more specific ways like “blurring, sallowness, blotchiness, pallor, queasiness” or conversely “bloom, skin clearing, freshening, definition, relief”. First, I have chosen fairly obvious examples of warm vs cool skin tone to make the point, but as we all know human skin is a spectrum in itself, taking in hues, values and degrees of saturation, and the reality is infinitely more nuanced than a couple of illustrative swatches can convey, so please don’t despair if you can’t “see yourself” in these illustrative examples. Second, remember again that colour has complex dimensionality, and moves from hue to hue as seen in the examples here but also from light to dark and from high to low chroma. Recall as well that the colours we see also involve combinations of reflected wavelengths or in other words, are not always “pure” slices of the visible spectrum. It is important to realize that the architecture of individual tones takes these multiple dimensions into account. Finally, then, the TCI 12 tone palettes are not built to a simple formula and while colour mixing is key to understanding their theory, the situation is more complex (and interesting) than might first be supposed. Remember, the human eye, skin and natural hair colours that we perceive are the result of only a handful of natural pigments involved in each, and print and digital processes can do a good job of reproducing the spectrum using a very limited range of only three primary hues, so it’s not quite as simple as “mix x and y and you will get z”. In the end, all colour is a wonderful perceptual illusion, and the human eye, comparing and contrasting, remains and will always remain the ultimate judge of the results. Those are very clear color mixes! Might I ask about your brand of paint? I’m interested in doing some color mixing. Do you use watercolor, gouache or acrylic? ilvxwiqgd Yeezy Boost,Waw! Its really great and wonderful ever i found. Thank you for sharing this info.